2nd. Quarter Q is now public. Yes, the 2nd quarter 10-Q was released yesterday. Did it answer all your questions ? You’re not alone ! Actually, it seemed to create more questions than answers. The biggest question for most investors is… why is there ZERO revenue listed ??? (see graphic below) It seems inconceivable that not 1 aspect of the company’s operations was able to produce even $1.00 of revenue. Are all the ads seen on the IC Places website non-revenue generating ads ? Are the shows like Hollywood Fast Lane, Travel Tech, etc not producing any revenue at all ? This seems so inconceivable that one wonders where these revenues are being recorded. Hopefully these revenues are being recorded somewhere or the company will have some other issues to deal with. The IRS has no sense of humor about under reporting or not reporting income. Mr. Samblis appears to address this issue here, where he states that small companies “don’t list individual sources of revenue or liabilities“. OK… that explains why we don’t see how much each of these shows bring in individually… but it does not address why what they do bring in as a total is not listed on the revenue line. On the surface, i.e. lacking a full explanation from Mr. Samblis, either those shows generate NO revenue… or… that revenue is being recorded outside of IC Punch Media on another set of books. And… for those of you thinking (speculating) that the revenue generated from these shows is in the Accounts Receivable line… there was only $3,200.00 listed there. If that is the entirety of revenue generated from those shows (and/or ALL business activities) over 3 months… then it might be time to reevaluate their worthiness to the business. The next biggest question/concern is the share structure. It seems that in the reporting period of approximately 3 months, the Outstanding Share count increased by some 94-million shares (see below), or, 124-million shares depending on which numbers you look at or calculate on. The 124-million is referenced in this excerpt from the Convertible Notes Payable section: “During the six month period ended June 30, 2013, notes with a face value of $67,500 and penalties in the amount of $16,250 were converted into 124,061,538 shares of common stock.”. (emphasis added) At an average PPS of about .002, that’s about $248,000. or $188,000. dollars of working capital generated for expenses and investments. Many feel that is a lot of cash to burn through without an explanation to the investors as to where its being spent. The number of shares of the issuer’s common stock, par value $.00001 per share, outstanding as of June 4, 2013 was……………….. 2,280,104,697. The number of shares of the issuer’s common stock, par value $.00001 per share, outstanding as of August 19, 2013………………… 2,375,204,697. Which leads us into the next biggest concern… no new information being put forth as to the current and future plans and actions of the company. We recently wrote about this here, and there are links in that post about previous posts on the same subject… i.e. this has been an ongoing issue that never seems to get any better. Mr. Samblis has a history of cherry picking the issues he wishes to discuss, and does so on message boards, and occasionally via press releases. He indicated here that he would issue a press release on revenue, however none has been released to date. Revenue is likely the biggest concern to all investors at this point, and not only is there been no revenue projections as promised, we have now seen 2 consecutive quarterly reports listing NO revenues at all. Mr. Samblis… you can easily calm investors fears by addressing some of the numerous previously posted questions, including the above. Take a peek at the PPS and see if you think doing so is necessary. When it comes to penny stocks… the answer is a resounding NO. We wrote about this 3-months ago to this day, here, and as it was true back then… its true today. Mr. Steven Samblis can be quoted as saying he would not release any news about the company “because he doesn’t need to“. Well Mr. Samblis… take a peek at the PPS… are you happy with what you see ??? If not, its about time to reevaluate the results of your decision to keep quiet. In short… your plan is not working ! We are now at about 35-days from “The World Launch” of VU Television Network. What do investors know about the company, i.e. launch plans, programming schedule, shows, advertising contracts, local content partners, etc, etc, etc. ? Answer… not much ! For investors, that’s not good. Some say the lack of activity to keep investors informed indicates Mr. Samblis really doesn’t care about the investors. Some say he may look at investors as just free money that allows him to chase a dream and aspirations. Whatever your thoughts, the one underlying common thread that binds all investors together… is the PPS… and its in the toilet, and circling the drain. Mr. Samblis has said that he will release information when the time is right, and he will do it via formal Press Releases. Well… 35-days from launch and many ask… where are these formal press releases? Earlier this month we also wrote about that here. If NOW is not the time… then WHEN ? Surely Mr. Samblis can tell us WHEN he plans to release information, even if he will not release information about the information he is going to release. Mr. Samblis… you are once again missing the “golden hour” as its referred to in medicine. The hour in which its critical to the patient’s life that intervention commences. The patient’s chances of survival are greatly reduced if treatment is not rendered in those critical 60-minutes. The same concept is valid in business also. Valuable time is being squandered, and the PPS is evidence of such. Mr. Samblis… the PPS is your report card, your performance review, your feedback from your investors, the tangible results of your efforts! How are your doing ??? Passing, or failing ??? Innocents killed… are YOU one of them ??? We couldn’t help thinking, when reading the below post from one of the bashers over on LieHub, about all the innocent investors harmed by the basher’s (and co-conspirators) deliberate attempt to destroy Steve Samblis and his IC Punch Media business. We have included the post below but have covered the name and post number because this low-life sick individual doesn’t deserve the attention he so desperately craves. We assume that although he brags about destroying Mr. Samblis, he justifies the collateral damage (i.e. investors that have lost money, perhaps their retirement money, as well as perhaps their friends and relatives money also) as stupid fools that deserve what they got for not listening to him. Or, perhaps these sick individuals were so blinded by rage at Mr. Samblis and/or IC Punch Media that they simply didn’t care about who else may be harmed by their deliberate deceptive actions. For those of you who may have been a victim of this deliberate conspiracy to destroy IC Punch Media and Steven Samblis, we urge you to file a complaint with the SEC. HERE is the link to file a complaint. It will only take a few minutes of your time, and although your 1 complaint will likely not get the attention of the SEC, rest assured that others reading this post are filing complaints also. Numerous complaints, thoughtfully drafted and submitted, will certainly catch their attention. Remember… “All that is necessary for the triumph of evil, is that good men do nothing.” (Edmund Burke) Don’t let evil win… file the complaint now ! Now… the bashers won the battle, but will they win the war??? Who knows. There appears to be some good things on the horizon, namely the launch of the VU Television Network on September 23rd, 2013. Will VU Television Network be successful… we think so, but the bashers are likely to step up their campaign of lies, deceit and general rhetoric in their attempt to keep that from happening. What can YOU do to keep the bashers from further destroying your investment… file the SEC complaint, then be proactive in getting the truth out. Post the truth (actual facts included) on any social media outlet you have access to. However, don’t bother with LieHub… anything positive about the company will likely be deleted. And remember… if you are invested in the company, don’t leave the getting the word out to others. Remember the quote from above about good men doing nothing. Fight for your investment ! 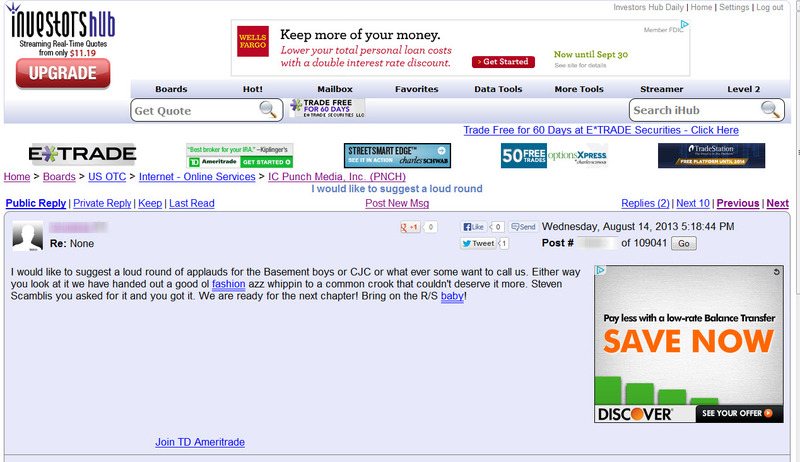 Yes, Mr. Steven Samblis, CEO of IC Punch Media seems to be frequenting the message boards again lately. There were some good posts, and we will get to them in a moment (want to save the best for last), however there were some not so good posts also. Its a subjective interpretation, but his posting frequency seems to increase leading up to the release of a quarterly report, and one is due out today or tomorrow depending on who you listen to. Of course we should be listening to the CEO regarding the timing of the release of the quarterly report… but Mr. Samblis is not talking about that. In one of Mr. Samblis’s less sensitive posts he responds to an investor’s question about current plans for the launch and why investors have be given little or no information, Mr. Samblis responds here, saying simply… “Because I don’t need to.” WHAT… because you don’t need to… Mr. Samblis, have you seen the PPS lately ??? How insensitive to have stated you don’t need to keep investors informed when many, (maybe most), long-term investors are significantly under water on their investments. The PPS is about the lowest its ever been, and Mr. Samblis says there is no need to promote the company and its achievements – a little over a month away from the biggest move the company has ever taken. Mr. Samblis’s response is simply inexcusable and unacceptable this close to the “world launch”. On a slightly different subject… apparently Mr. Samblis came to the Hangout board (likely because he is suspended on the LieHub board) late in the night/early morning on the 13th. Apparently, there was some heavy discussion that transpired. However most investors will never see the exchange between some investors and Mr. Samblis because according to one post, here, over 20 posts were deleted in a short period of time. Now you can follow the posts regarding censorship starting with the above referenced post, but in short, readers and investors are not seeing the full story. Even though the Hangout board was started because, in part, pro-PNCH posters were being deleted over on LieHub, they appear to be engaging in the very same censorship tactics that the board they despise engages in. Its sad that MOD’s and Admin’s on BOTH boards are not confident enough in their facts and opinions to let opposing posts stand, and let the reader decide the post’s merits. In essence, the persons deleting posts are deciding what you can see, and what you can’t see. Apparently they think they know what’s best for you. We believe… this is an insult to the readers of their boards. Just a note… if you want to see if posts are being deleted, simply look at the post numbers (usually on the left hand side of the page) and take notice to the gaps in the numbers. Gaps indicate deleted posts. There is an excellent article on message boards here that is worth a few minutes of your time if you are new to message boards. Now, as I promised, Mr. Samblis did post a few good posts. One of the main issues the bashers like to post over on LieHub, is the issue of dilution. Mr. Samblis has addressed this several times in the past (and we believe he can never discuss it too much) so these posts are simply consolidations of previous posts on the subject, however he did a good job setting the record straight. See some of the posts here, here, and here. Frankly, investors need more straight-to-the-point, matter-of-fact type posts from Mr. Samblis, and far less of the posts where he attacks the poster for asking an emotionally charged (but very valid) question. Mr. Samblis accomplishes far more good for his company when he sees past the emotion and addresses the question being asked, in spite of it being asked in perhaps a less than perfect and respectable way. And certainly he accomplishes far more good for the company when his answers are not deleted because of something he has directed at the poster that was less then professional. Now we wait for the quarterly report. No one expects it to be good, but there is anticipation none the less. Once the quarterly report is posted… then its on to the launch, still on schedule for September 23rd. according to Mr. Samblis statements on the 12th. Hopefully there will be no delay in the launch, however some more news surrounding the details of the launch would certainly be in order right about now. One wonders how long Mr. Samblis is willing to let the PPS hover just above the tripps just because he doesn’t want the bashers to have any information before the launch. CEO defends his company ! Well… Steven Samblis, IC Punch Media CEO was posting on the LieHub board today. We count 13 posts today as of about 8:00p (eastern). The difference today was Mr. Samblis appeared to have defending his company in mind instead of promoting his shows, or instigating controversy. He addressed a few of the incorrect statements (favorite bashing techniques of the hard-core bashers), like dilution, no revenue ever, association of VU Television Network to IC Punch Media, and yesterday he also put to rest the controversy over his ownership of the infamous Bentley he was pictured driving (stated it was a friends, and he does not own a Bentley). We have to give it Mr. Samblis… he came to the fight with facts, and laid them out in a professional, coherent, and logical manor. The bashers on the other hand brought spitballs to a gun fight. While Mr. Samblis posted facts, the bashers could only deflect and pivot to other unsubstantiated accusations and childish name calling. Not that anyone should feel sorry that the bashers got beat up, bad, it was also very funny to watch. Its a shame it wasn’t a recorded conversation, everyone could have heard the bashers stuttering. Mr. Samblis made it clear, in no uncertain terms, that; a) he is not selling stock, and b) for him to sell ANY stock, even the conversion stock… he needs to follow the rule #144, i.e. give notice and sell according to a limited allowable schedule. Keep in mind… even though this may only be a message board, it qualifies as public statements by a CEO of a public company. Any misleading statements could have grave consequences for Mr. Samblis personally, as well as his company. i.e. you can believe what he says publically. Although we have made our views about LieHub known numerous times here on this blog, we reluctantly encourage you to take a trip over to LieHub and follow the posts starting about here. We think it will be worth your time to see the PNCH CEO defend some of the many lies the bashers post 24/7/365. Mr. Samblis… thank you for addressing some of the bashers accusations head on. We still wish you would have done so on the Hangout, but investors can be satisfied you at least did it somewhere rather than just ignore the constant bashing in hopes it will just go away on its own. At least now potential investors can see what an unsubstantiated accusation looks like in the face of facts and public statements by the CEO of the company. Mr. Steven Samblis, PNCH CEO, spent some time last night over on LieHub promoting his Hollywood Fast Lane “Oblivion Special”. We have viewed the production and found it to be interesting, and well produced… we think its worth the time to watch it. Now… having said that, we have some observations, hence the lead-in of “Priorities”. It would appear to some that creating and producing a piece like this takes time and energy. This piece was so well done that it begs the question… is Mr. Samblis more concerned with making movie review segments for his Hollywood Fast Lane, or, making PNCH profitable, and increasing the PPS of the stock? One can only imagine the time involved in lining up the talent (stars, producers, etc. ), then filming the segments, editing, reviewing, re-editing, etc, etc, etc. And, no matter exactly how much time it actually did take… wouldn’t the time be better spent working on the Launch, Network startup, Press Releases, the PPS, etc., given that the PPS is currently at a 52-week low, and perhaps at or near to an all-time low? Now, some will say… this is part of his job, and a successful Hollywood Fast Lane creates exposure for the rest of the company. However… we didn’t see much in the way of cross-promoting to his VU Television Network. In fact, we didn’t see anything that related the Oblivion piece to PNCH or VU Television Network, even within the credits. In a related issue, (still related to Priorities), Mr. Steven Samblis promotes the “Jobs-behind the scenes” over on LieHub. Why would Mr. Samblis turn to LieHub as the first place to promote his work. The bashers over on LieHub bash him constantly 24/7/365. Is this the best place to promote your company and/or its work??? He also promotes the “Oblivion” piece there also. Take notice that he finally did promote the Oblivion piece over on the Hangout some 24-hours after first promoting the Jobs piece on LieHub. So… it can be said that when there is promoting of the company and/or its work… Mr. Samblis chooses LieHub over the Hangout. Another observation… take a look at the “Samblis PNCH” posts over on LieHub starting with when Mr. Samblis starts promoting his work, say here. Then a bashers posts his usual nasty/rude/disrespectful post here. Now look at Mr. Samblis’s response here. Now, in constrast, let’s look at a similar exchange over on the Hangout. Mr. Samblis posts his promotional piece, then a poster responds here. Mr. Samblis responds here. Mr. Samblis does a follow up post here after some more back and forth. Notice the “Listen pal” friendly opener. Now, regardless of your opinion on the level of disrespect Maynerd’s post afforded to Mr. Samblis (certainly far less than the bashers post)… do you notice any difference in the manor Mr. Samblis treats posters on the Hangout as opposed to the hard-core bashers over on LieHub? We feel there is a clear and unmistakable resentment towards unfavorable posts on the Hangout over those on LieHub. It begs the question… WHY? Where are the Priorities? Final observation tonight… there is no doubt in our minds, and many others as well… Mr. Samblis needs to hire a public relations professional (PRP). We doubt the very worst PRP would ever recommend responding and treating investors the way Mr. Samblis treats posters on the Hangout who ask very legitimate questions (albeit perhaps letting their frustrations surface in the wording). Mr. Samblis can not be proud of his behavior towards these posters. And if he is, that certainly supports and reinforces the need for a PRP. Mr. Samblis… WHERE are your “Priorities” ? Press releases… where are they ??? Back in around the time Samblis split from Collins, a new strategy was adopted, and that was, to cease releasing any non-formal company news and achievements in venues such as message boards and social media. The new strategy was to only issue formal press releases for any news about the company. Many now ask… how is that strategy working? Some, maybe many, say… not so good. In late April / early May of this year, the Collins/Samblis split occurred. At that time PNCH share price was around .005. And April 1st. through about mid April, the PPS was over a penny. Now, early August, the PPS has hit the tripps, after trading sideways in .001 range for quite a while previous to hitting the tripps. There hasn’t been a formal press release since June 24th, when PNCH announced its partnership (or more specifically a Letter of Intent to partner) with China’s Investment Advisors Ltd. Beijing. In contrast, PunchTV (Samblis’s nemesis) has released 11 press releases in July alone, and another 2 in August already (and its only August 2nd. today). You may verify such here. Additionally, while one CEO is being recognized by the California Legislative Assembly (see article here), our CEO releases predominately news of his association with the Hollywood personalities, in association with his Hollywood Fast Lane host duties. Quite the contrast some would say. It seems hard to believe that there has been NO news or accomplishments since June 24th. If that is accurate, anyone who has a job can relate this to telling your boss that you have no accomplishments in over a month. How much longer do you think you would be working there if you could not produce at least 1 accomplishment in a month? Now, if there have been accomplishments in the past month… it begs the question… WHY haven’t these accomplishments been publicized ??? It appears the new strategy has not proved successful ! It may be time to rethink that strategy. It is hard to argue that the association of the limited press releases and the low PPS are not related. There has certainly been ample testing time to gather the data from the effort, however at some point Mr. Samblis needs to see the results of this new strategy, and understand that while it was a plan that might have had potential, and was worth testing, it is clear now that the effort has not been successful.